In a world divided by clan boundaries and strict taboos youngest daughter of High Priestess Shira prepares for her Visioning ceremony. Yetsye Shirasdatir must choose a path. Life and deather are in her hands. If she chooses life, something precious will be sacrificed. For while Azilet'zal always provides, a balance must be maintained. Thankfully, no child of Shira ever walks alone. And quests often open doors long locked by misunderstandings. With the aid of her siblings and some surprising new friends, Yetsye sets out. There are a couple of problems, though. This isn't the first time someone tried to unite the Clans. Their failure built the walls she's trying to knock down. She's also much younger and painfully shy. Will Yetsye be able to overcome her fear of people? 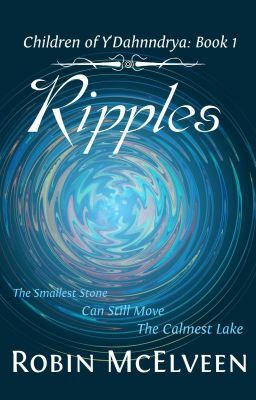 Will she throw the stone that starts the ripples of change in her world? Or will the required sacrifice shatter her resolve? One small stone still has the power to stir the calmest lake.